Growing up, I think I wanted to be anyone other than who I was. I wasn’t a happy kid, and with few to no friends, I sought escape through books, movies, and TV as a way to project myself into any other life that wasn’t mine. And I did it a lot! And because of this, most of my first crushes were actually girl crushes. Who didn’t want to be Cindy Mancini from Can’t Buy Me Love—beautiful, popular, and off on shopping sprees with her mom’s credit card and her blessing? How many of us didn’t envy Samantha Micelli from Who’s the Boss?, growing up in a beautiful, happy home with a closet full of the cutest clothes? Time and again, I wanted to be in a Johanna Lindsay novel or a Helena Bonham Carter movie, because it was the life I wanted, and I was in love with their worlds, their (fictional) lives, and most of all…in love with the fact that it was far from everything I knew and was surrounded by. Not only would I be free of the stresses at home, but I wouldn’t be me, either. I was in love with the idea that “someday” I’d be magically different and so would my life. Someday, it would happen for me. And the great thing is, it did. Although now, I don’t want to be anyone else, and my life that I love didn’t happen magically at all. I kind of learned through lots of trial and error that we’re, in fact, very powerful, and all we need is some determination to get what we want—be it success, significance, and/or happiness in our work and family. Keep your eye on the ball and make a plan. Doing that, I created a life I was in love with. Special thanks to Penelope Douglas for sponsoring this giveaway. I think this sounds really good. Thanks for sharing. I will have to check it out. This sounds really interesting, would love to read it. What a clever premise for a book...this sounds very intriguing! Thanks! Sounds like a fantastic book, and I love the cool cover. thank you for showing us this, now I need it!! vivid cover art! love the premise of this story. 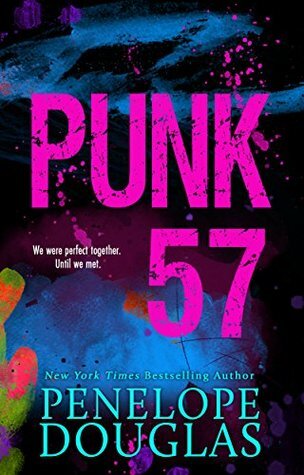 Can't wait to read Punk 57! Penelope is a new to me author. Can't wait to check it out. What is you favorite type of story to write? Punk 57 sounds like something I and daughter would both enjoy. Samantha had amazing clothes! Yes. I think I wanted to be just like her too.